Bizarre Creations combines the street racing thrills of its Project Gotham Racing series with the neon glow of its Geometry Wars games, throws in a little WipEout and Mario Kart and winds up with Blur. The realism of real world cars and tracks blends with the explosive audacity of Mario Kart-esque power ups—almost every power up strewn about the tracks of Blur has an equivalent in Nintendo's long-running kart racer—for an mix that's initially jarring, but soon feels familiar, as the neon light pouring off taillights and force fields surrounding Fords, Land Rovers and BMWs starts to feel believable. Blur sits somewhere in-between simulation and arcade-style racer, excels in multiplayer and challenges the recently released Split/Second for the high intensity combat racing crown. Let's focus on what we love about Blur first. 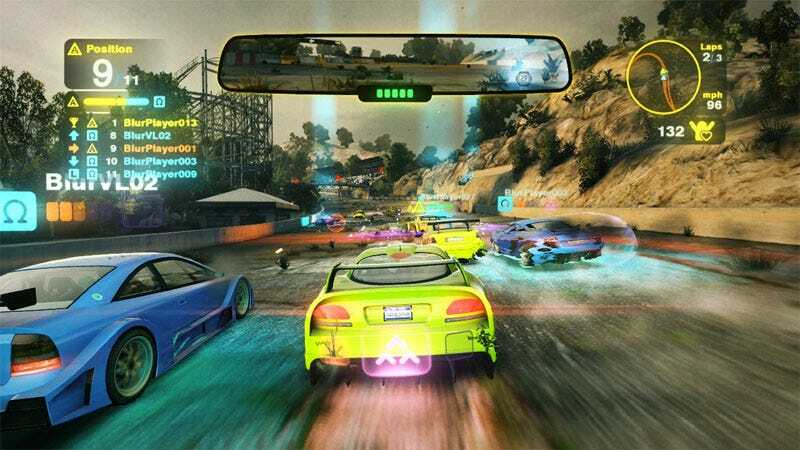 Grippy: It should be no surprise, given developer Bizarre's racing pedigree, that Blur's driving mechanics are sound. There's an occasional hiccup or two when races become terribly chaotic, thanks to events that throw a sometimes unmanageable 20 cars on the track at once, and the constant firing off of turbos and projectile weapons, but quirks are rare. There's a solid drifting model a real need to pay attention to one's driving line, but even racing game novices should find a thrill in Blur. The Sweet Spot: Blur's impressive balance between sim and over-the-top arcade style racer offers an interesting challenge for the racing enthusiast who finds Mario Kart too coddling or WipEout too floaty. There's a surprising level of strategy to the game's power ups, with mines and projectiles that can be fired ahead or behind; weapons that can cancel other weapons; and turbo boosts that can help evade homing missiles or provide intensely sharp braking. The strategy of what power up to pick up when, so as to prevent another player from acquiring it, decisions that must be made in the blink of an eye, give Blur more than just fast-paced racing chops. Challenges Dripfeed: Blur is a pusher of achievements, trophies and challenges. Each race has goals that go beyond simply placing first in a race and doles out a constant stream of rewards, a regular sense of progression that's incredibly addictive. Blur nicely breaks down the pursuit of virtual accomplishment with its distribution of stickers—achievements divided into sub-achievements. Boss battles require that players do more than just outrace opponents, but also experiment with weapons and tackle mid-race challenges. It can be overwhelming at times, but Blur's tracking of everything the player does only enhances its replayability. Hours Lost To Multiplayer: After becoming frustrated and giving up on the game's career mode at one point, I found the best side of Blur, its online multiplayer portion. The game's artificial intelligence is no match for a group of flesh and blood racers. Online races tend to have fewer contestants than career mode matches, make for more even races and a better sense of rivalry. Blur plays up that friendly rivalry with challenges that players can share with online friends and enemies and lets players share their accomplishments via Twitter or Facebook... if they so choose. Information Display: Given the high volume of things to accomplish, items to unlock, and career milestones to surpass, Blur's UI design is a commendable for its easy digestion. It's not often I find myself appreciating the information design of a racing game, but Blur presents its massive list of events, unlockables and achievements in a beautiful way. Perks & Promotions: Online racing in Blur is a constant cycle of receiving new awards, hopping from race to race and enjoying a steady stream of progression. There are car mods to unlock, which can have a huge impact on your strategy, not to mention the siren's song to play just one more round of Blur's multiplayer. Challenge Spike: About halfway through Blur's career mode, the difficulty ratcheted up to a point where competing become torturous. With 20 cars on the track, the stressful jockeying of AI-controlled opponents all clustered together in a tight grouping became incredibly frustrating, a fight to progress while a wall of masterfully piloted cars sucked up every power up ahead of me. Chalk it up to bad driving, as I've seen plenty of players finding a spot on the online leaderboards while driving on Hard difficulty, but I hit a wall during Blur's career mode and started hating every minute of it. The Daily Grind: There's a good deal of repetition in Blur's career mode, thanks to a small selection of race types: Race, a battle for first place; Destruction, a weapon-filled battle against a series of drones and the clock; Checkpoint, a sprint to reach checkpoints while accumulating time and turbo boosts; and One-on-One, two player boss battles. The selection wears thin rather quickly. You'll revisit the same locations again and again in the pursuit of tokens known as Lights, which can mean many repeated races in order to move on. Bizarre Creations' Blur is an exciting racing game that grows on you quickly and is difficult to put down. The racing is fast, the constantly fed RPG-like progression incredibly addictive, and the tension of projectiles—specifically the red shell-like "Shunt"—bearing down on your car or rapidly humming past you on a path to a competitor, provide a steady stream of thrills. Blur borrow more than it innovates and doesn't carry the same visual punch of some of its direct competitors, but it's a great Mario Kart alternative for anyone without a Nintendo system to take online. Blur was developed by Bizarre Creations and published by Activision for the PC, Xbox 360 and PlayStation 3 on June . Retails for $59.99 USD on . A copy of the game was given to us by the publisher for reviewing purposes. Played through six of nine career levels, testing easy, medium and hard difficulties. Competed in dozens of online races, eventually ranking up to level 16.